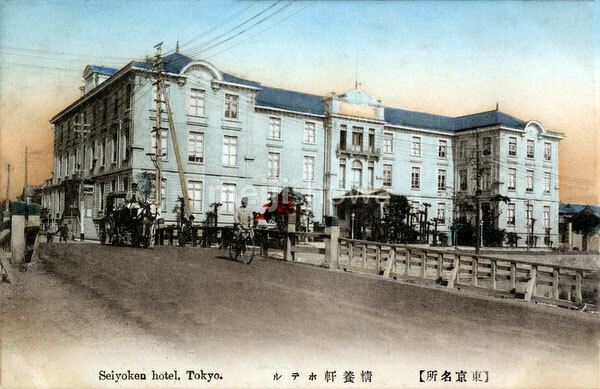 The Tsukiji Seiyoken Hotel (築地精養軒) in Tokyo, the first Western-style hotel owned and managed by Japanese. Until 1890 (Meiji 23), when the Imperial Hotel was opened, the Tsukiji Seiyoken offered the best Western-style cuisine in Tokyo. It even furnished imperial banquets. Opened in 1872 (Meiji 5) at the Foreign Settlement in Tsukiji by Shigetake Katamura, its importance diminished after 1899 (Meiji 32) when foreigners were allowed to live anywhere in Tokyo. The three story building in this image was built in 1909 (Meiji 42). It was destroyed by the Great Kanto Earthquake of 1923 (Taisho 12). The company lives on as a restaurant in Tokyo’s Ueno.